I recently attended a blogger event at Lush Meadowhall to have a look at the new Easter collection, which is now in store. You can find my post about the event here. I was given three bath bombs from the Easter collection to take away with me and try out and the first one I used was Hoppity Poppity*. Hoppity Poppity is a small bomb in the shape of a rabbits head. He has pink eyes, a pink heart shaped nose, pink whiskers and a little o mouth. He contains violet leaf absolute, lime oil and popping candy. I did take some picture of the bath while he was dissolving but there really wasn't very much to see so I haven't included them. This is quite a quick dissolver, taking maybe 30-60 seconds to disappear. The bomb is primarily white but you do get a flash of pink and I think I saw a little green as well. There is some froth while he's dissolving but once he's gone this disappears completely and all you're left with is some popping candy popping away in the water. One thing I noticed about the Christmas bath bombs I bought was that I unable to detect any scent when I dropped them in the bath. This one however was the complete opposite. As soon as I dropped this in the water the scent of Palma violets filled the bathroom and this lingered through the whole bath. I also noticed that I could smell this on my skin later and that I could still smell it in my bathroom the following day. I have slightly mixed feelings about Hoppity Poppity. I really liked that I could smell this one as it's the first bath bomb I've used recently that I've been able to smell. I also liked that this did appear to have some skin conditioning benefits. I could see some oil sitting on the surface of the bath and my skin did feel moisturised when I came out. The thing I'm not so keen on is that apart from the popping candy there wasn't much 'show' to this. It dissolved quickly with mostly white froth/foam and didn't colour the water at all. However, I do think the smell and skin benefits make up for this and as a small bath bomb it's reasonably priced at just £2.50. 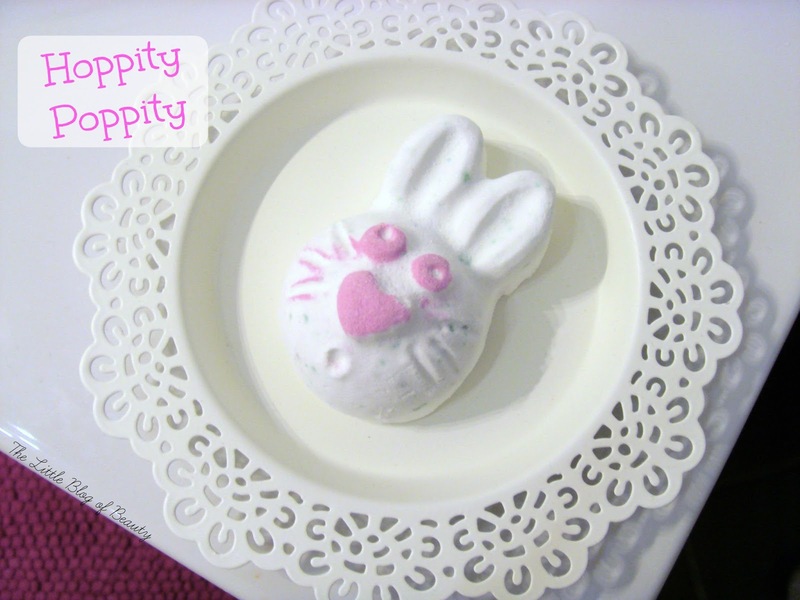 Hoppity Poppity is available now in store and on the Lush website. Have you treated yourself to any Easter bath bombs yet? This looks so cute and I love the smell of violets - may have to give this one a go!